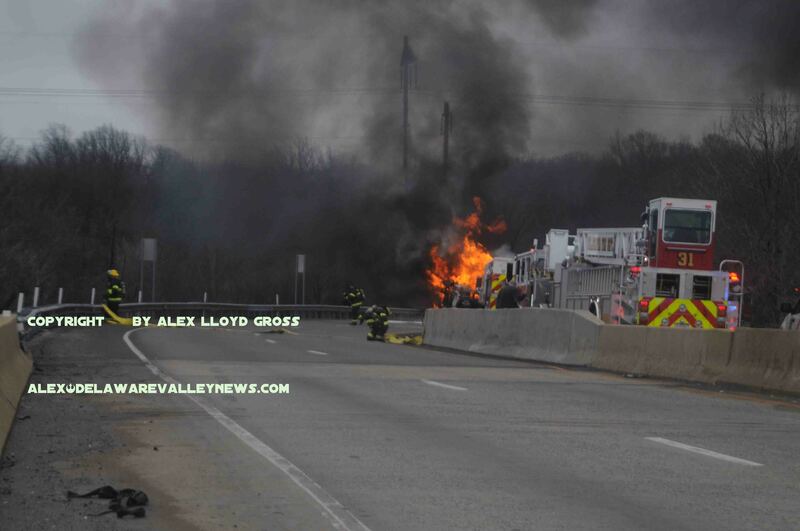 Alex Lloyd Gross- Photo- Delaware Valley News.com Philadelphia and Bucks County crews work together at the scene. Alex Lloyd Gross- Photo- Delaware Valley News.com The tanker on fire before any firecrews could put water on it. Two people were seriously injured following an accident with a tractor trailer. Just before 10:00 AM a tractor trailer traveling north exited at Woodhaven Road. On the curve of the exit ramp, it flipped over and caught fire. The truck was a tanker hauling an unknown substance. When it flipped, it caught fire almost immediately. 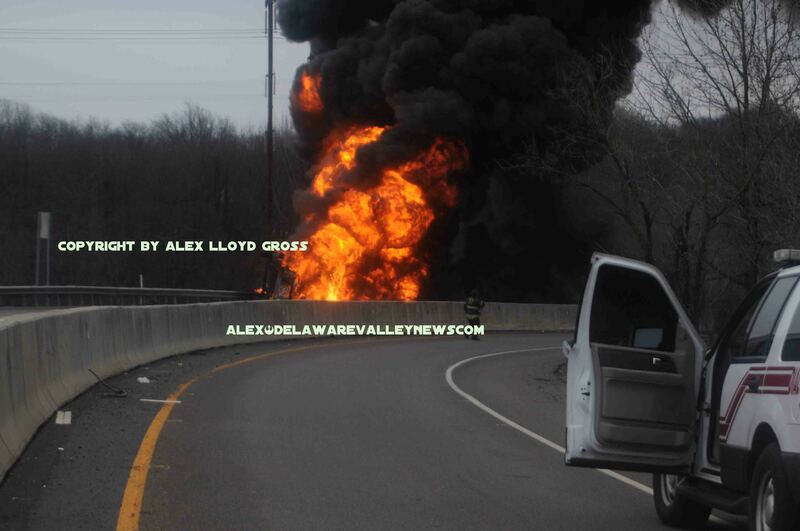 According to Pennsylvania State Police, a driver and passenger were seriously burned. One man was walking around dazed with serious burns on most of his body. Two medic units were called quickly and they came from Bensalem. Philadelphia Fire Units responded to assist as well. Water was a serious issue and fire crews special called foam trucks, and they also put large diameter hose across the exit ramp.Before the could do that, they had to verify that it was completely closed. Companies used hydrants that were in the park and ride area, which resulted in massive hose stretches through the area and road closures. Much of the park and ride was closed to cars. Firefighters had to call in tankers from Florence New Jersey, Lower Makefield and Lingohocking due to water supply issues. Crews had to set up a series of ground ladders up a hill from the park and ride to the exit ramp where the fire was. They then hauled large diameter hose up the ladder to gain access. 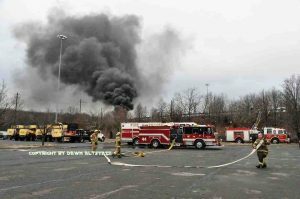 The road will remain closed for most of the day as crews must insure that there is no fire before heavy wreckers can haul away the remains.